Under GRATITUDE Tags: Funeral Memorial Template, funeral program template, Funeral Service, Funeral Templates, Funeral Thank You Notes, How To Write Message Of Graitutde. permalink. 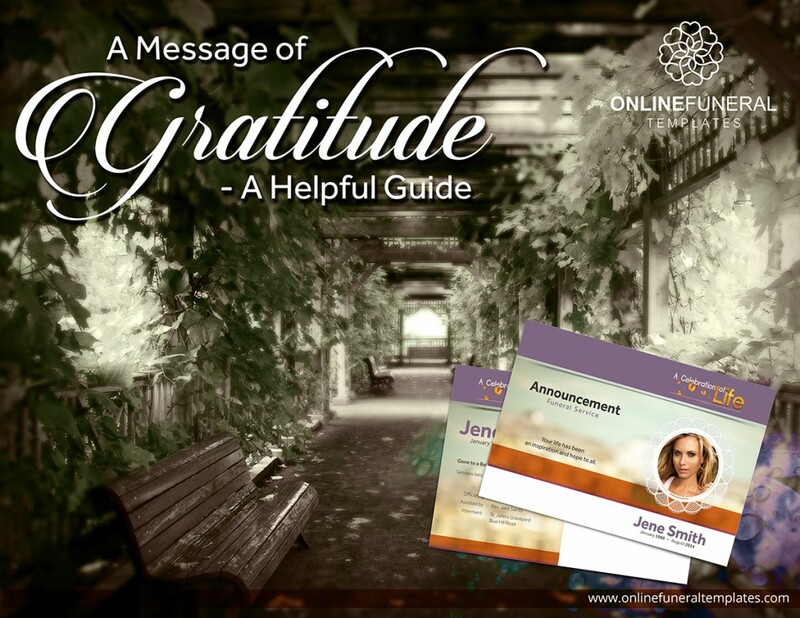 MESSAGE OF GRATITUDE- A prime Message of Gratitude is the manner of Gratitude given or shown to all the people attending the Funeral Ceremony, for their support, prayers, and presence in that difficult time. This kind of Gratitude is usually printed in the Funeral Program Template and read or given to every member present in the process. Basically, it is given on the last page of an Easy Funeral Program Template. How are you Feeling about this occasion? PARTIAL OBITUARY OF THE LOST PERSON- In this segment, you have to mention about the personality traits of the deceased person. Mention about their life traits, including their character, profession, nature, and noticeable accomplishments. SHOW GRATITUDE- This is the third and last segment of the Message of Gratitude. In this segment, you have to show your sincere gratitude to all the presented people in the Funeral Service. Today we celebrate the Homegoing of our beloved. Our hearts are full and saddened. We will truly miss the kind-hearted and admirable person that Howard was. Howard was generous, easy to get along with and very humble. He gave no trouble, but was always willing to lend a hand. He has touched and inspired many. We appreciate Howard for everything he stood for and all that he gave us over the years. Your kind thoughts and expressions of love we will forever hold with us, and use them to strengthen us during this time of challenge and transition. Today we rejoice the Homegoing of our adored Late Alex Parker. Our hearts are full and dismayed. We will truly miss the compassionate and worthy person that Alex was. Alex Parker was a humble, generous and an amiable soul who is no longer with us. In his 65 years of cherished lifetime, he never gave any kind of trouble to anyone. With his friendly attitude, helpful nature, and devotion to education being a chairman of Merry Gold School, he has touched and changed the life of many. We appreciate Alex vision and fortitude for the education of every person in the United States, and all that he gave us over his lifetime. Our family wishes to convey our sincerest appreciation for your prayers and support during Alex Parker’s passing. We are blessed to have friends like you and are thankful for all you’ve done. Well, today we have discussed everything about Message of Gratitude(Funeral Thank you note) for a Funeral Memorial Template. If you want to know about our customize Funeral Program Service, then please don’t hesitate in contacting us. We will be more than glad to assist you.